-Try our pizza - make fresh each morning and available by the slice - available eat-in or takeaway. 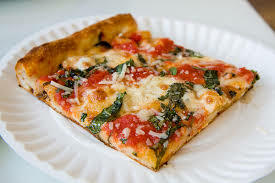 The pizza dough makes for a thin and crispy base, and the pizza toppings are authentic and fresh. The toppings change each day, but there are always two types - one with salami and one meat-free. Made the traditional way with authentic Italian 00 flour, and Durum Wheat semolina, our pizzas are thin-crust and crunchy (​To learn more about 00 Flour try our 00 Flour food fact). Each pizza-slice is heated in the oven at 190C before being served, so the cheese is nice and hot. ​Available Monday to Saturday from around 10:30am to 2pm, or until sold-out (If that should happen, we can at least provide a recipe for making your own pizza dough). Generally, the pizzas are put in the oven around 10am, and then cooked and cut into individual pizza-slices approximately 15cm x 12cm. The timing varies according to the day and the pizza ingredients, so just ask our staff about availability today's toppings.